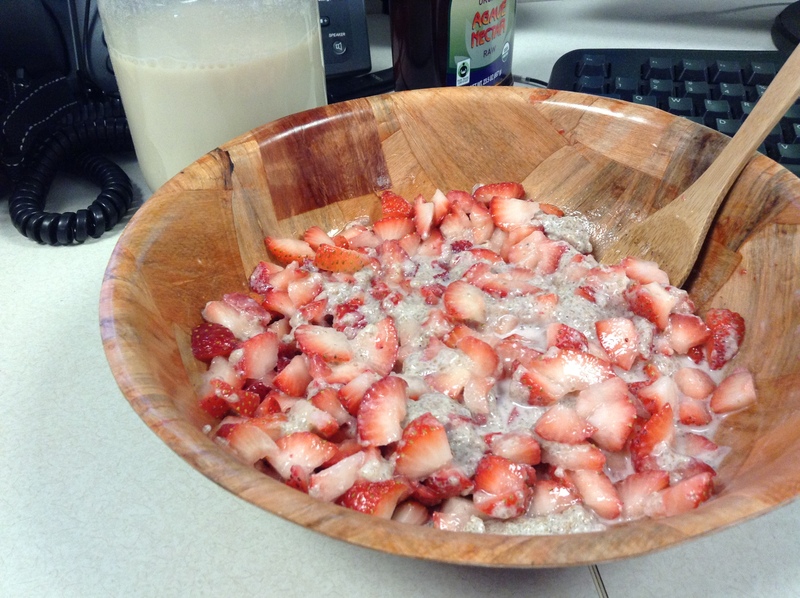 I didn’t have a chance to prepare the quarts this morning, so I took all the ingredients into work. I juiced six lemons by hand into a pint jar. I made the mixture throughout the day as needed. By 4 pm, I am starving! Looking forward to making another quart when I get home, as there’s not enough lemon juice left to make another batch. I scheduled a massage and sauna session for this weekend. The most relaxing way to detox! At this point, I’m pretty sure I’ll break fast on Saturday. 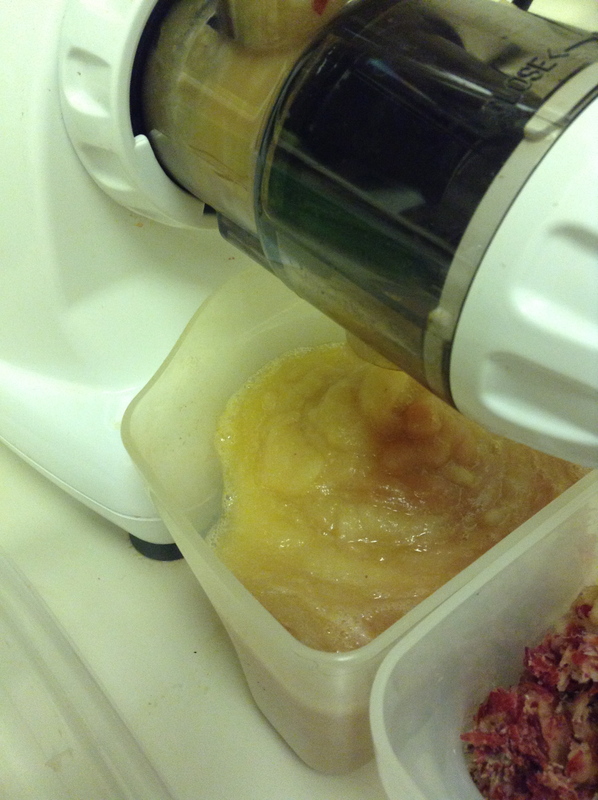 Things are flowing as they should again, plus I’m ready for food… raw food. Today, I went shopping for cashews and cold-pressed EVO (olive oil). 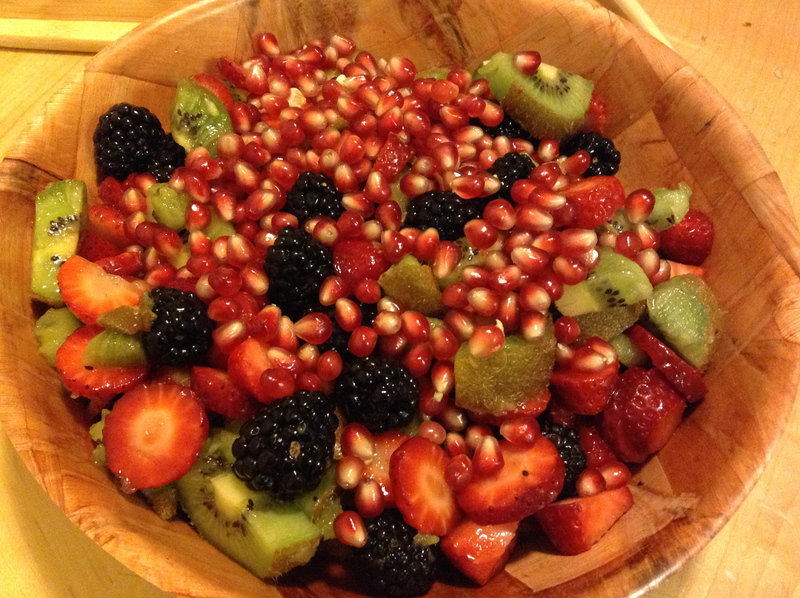 Having read Dr. Graham’s 80/10/10 book earlier this year while on an OJ fast, I plan to be more cautious about the heavy-on-the-nuts-and-seeds, high-fat, raw gourmet meals, and keep it simple. I took four psyllium husk capsules first thing this morning. Later on, I thought I kept swallowing bits of something…what, I don’t know. Then I realized the little thing at the back of my throat (uvula) was the culprit. It was hanging down on my tongue, as if it has stretched or something. It’s tickling the back of my throat. Detox? Dehydration? In other news, I received my last fruit box of the summer season. 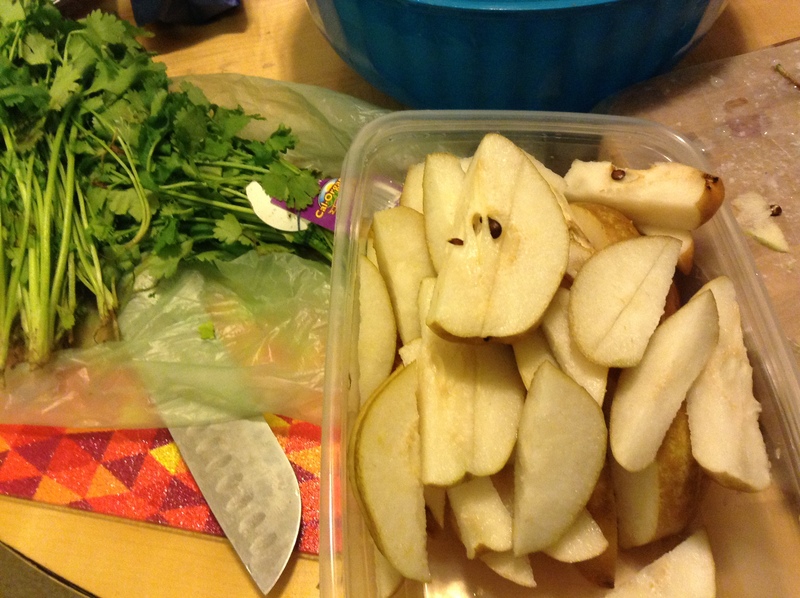 I signed up for a CSA delivery from Avalon Acres twenty-six weeks ago. I started out with a Produce/Veggie Box, which was amazing! The spinach and onions were always my faves. As the season progressed, I would get “tougher” veggies I didn’t really care for or use that much in its raw state. Those I would typically give away to others in the program. But fruit, I can always use! 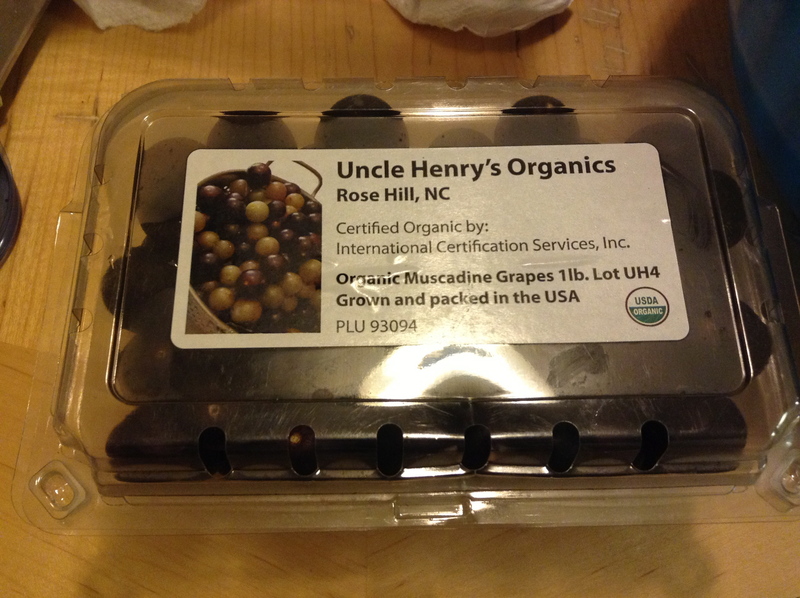 Last fruit box of the season: muscadines, scuppernongs, pears, and apples. Due to the hanging-uvula issue from yesterday, and doing my own “diagnosis” online, I added apple cider vinegar (ACV) into my fluids because apparently, if the tissues at the back of the throat are inflamed, it can cause such an issue. There was also mention of being exposed to strep throat, and I have been recently. The ACV is supposed to take care of the inflammation. 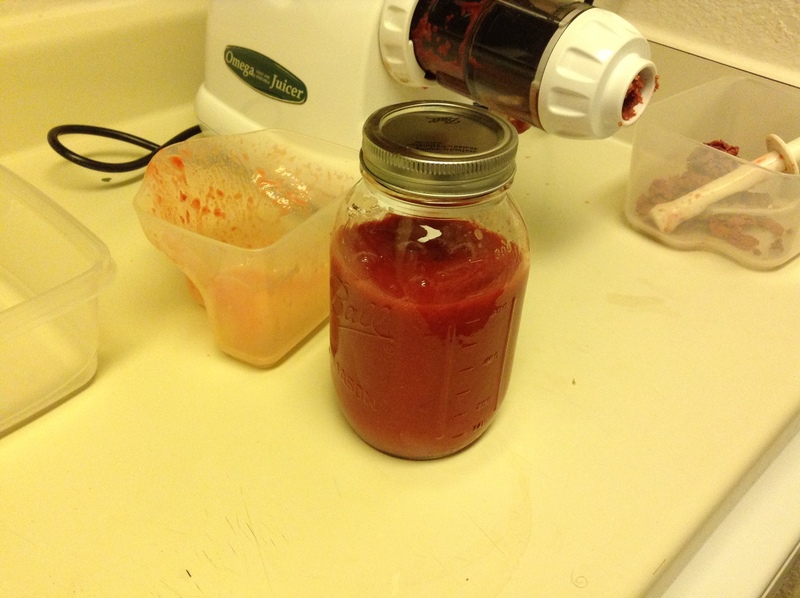 So, I attempted to juice my CSA apples, and they only made applesauce! Trick or treat, I guess. lol I poured it in a jar for later, after the fast. Looking forward to (raw) food! As far as weight loss, I have lost 10 pounds in one week. I began practicing Ashtanga yoga in July. I didn’t go to class last week since I was just starting the fast. I went today though. Not good. I got very dizzy and hot, before the actual Primary Series even started. = ( Because I drank so much fluid, way more than my body weight in ounces, I thought I could make it through class. And I did make it, but I was constantly watching the clock. I felt like I was in a Bikram hot yoga class. On the plus side, I did have a little more movement today…must be the old stuff since its so dense. Just glad something happened. Things were getting too backed up. I want to start back eating, but I’m not ready yet. Plus, I haven’t gotten any of the benefits I’m seeking so far. 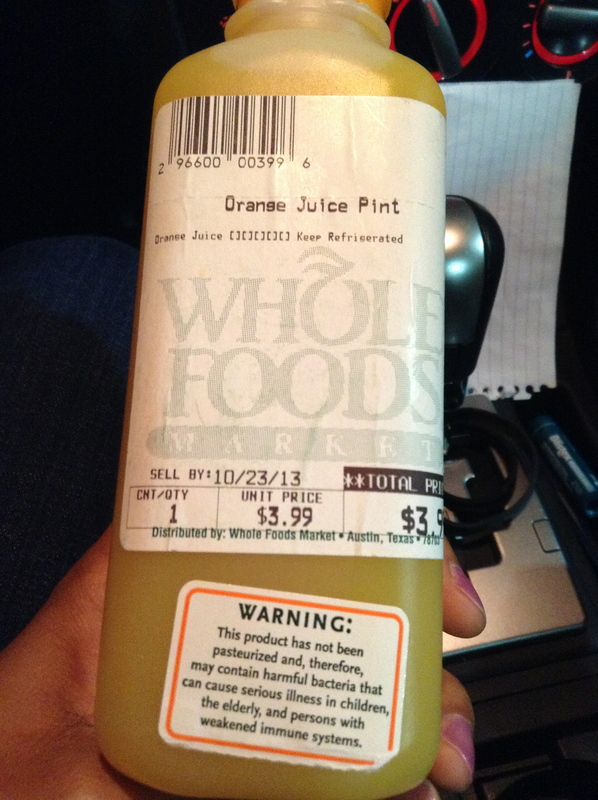 I bought Bernard Jensen’s Juicing Therapy book for inspiration and information at Whole Body, while I was in the area. Tonight, I took four psyllium husk pills. All the coconut water and just-fruit juices have been great, yummy, and convenient, but I feel the need to start back having green juices every day. They really pack a powerful punch! 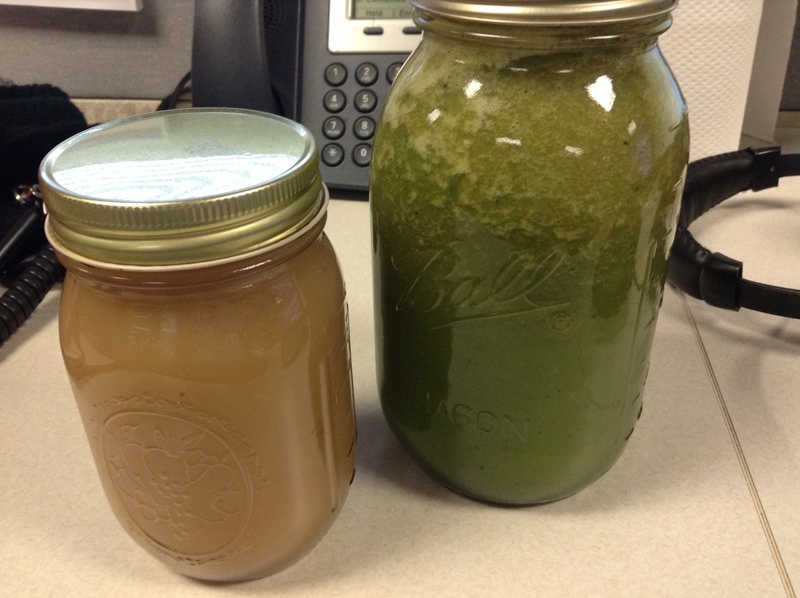 The apple-kale juice really woke me up this morning. On lunch break, I bought Master Cleanse by Stanley Burroughs at a health food store. There is so much info in this little yellow book! I’ve passed it up many times. Glad I gave it a look this time. I’m just reading it for some motivation and knowledge…not actually doing the Cleanse right now. I was regular this morning without taking any psyllium supplements last night, but I took four of them today anyway. Today — and this may be too TMI — it felt like the pipe unplugged. I went five times! I felt LOTS of discomfort in the evening, to the point where I could not sit down straight. And so I drank more juice, and lots of trapped gas was released. My stomach was noticeably flatter afterwards. My cycle started without the usual cramps. Love when that happens! 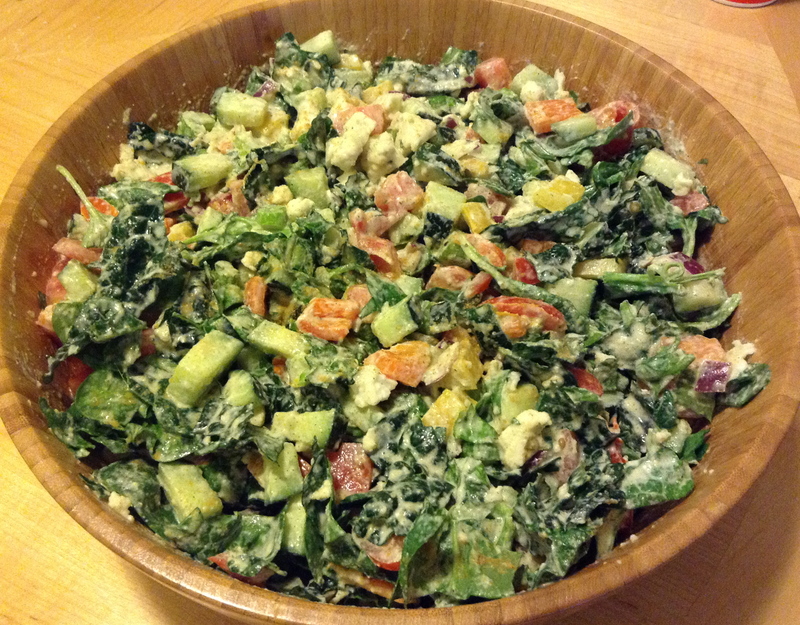 I’ve experienced that on raw vegan stints and pure, whole food eating phases. And…my tummy was super flat this morning, after all the releasing yesterday. Yep, that’s all I had today, and it felt enough. 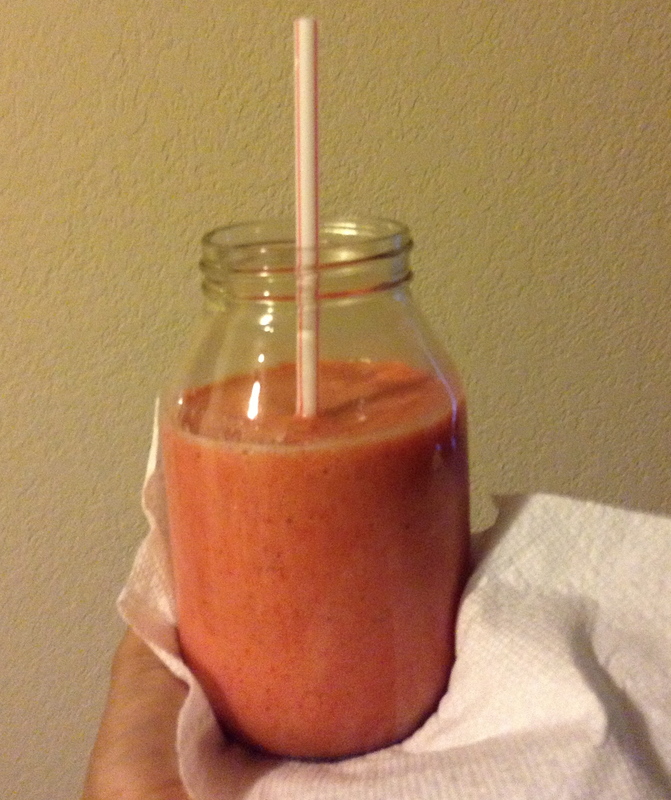 I started this day with a Strawberry-Kiwi-Lime smoothie. Hey, I didn’t want to waste my strawberries! And now, begins the juice fast. 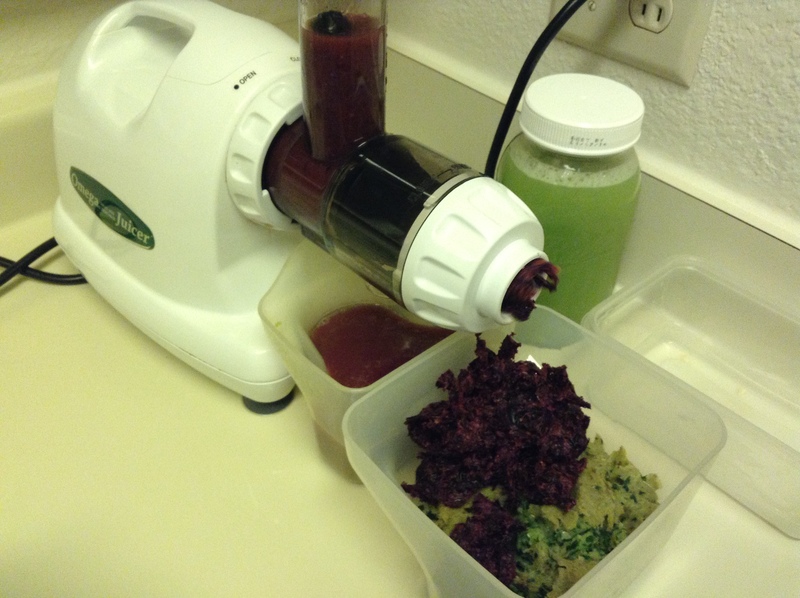 All of the Beet juice, Half of the Carrot juice, and some of the Celery-Lime-Basil-Pear. So, the six quarts were not needed today, BUT I’d rather have too much than run out and feel the need to binge or something. As for pacing, I drank one and a half quarts of juice during the work day, and I drank the grape juice when i got home at night. Weight loss is not really one of my main goals, but it’s always a plus to release excess weight, so I decided to keep up with poundage lost. 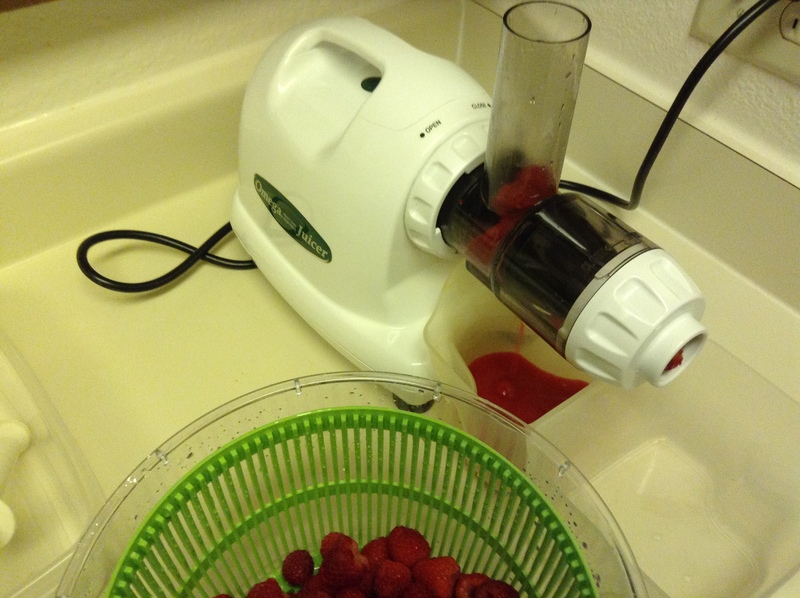 I made raspberry juice out of two 12-ounce packages of raspberries (Driscoll’s) I purchased from Wal-mart. 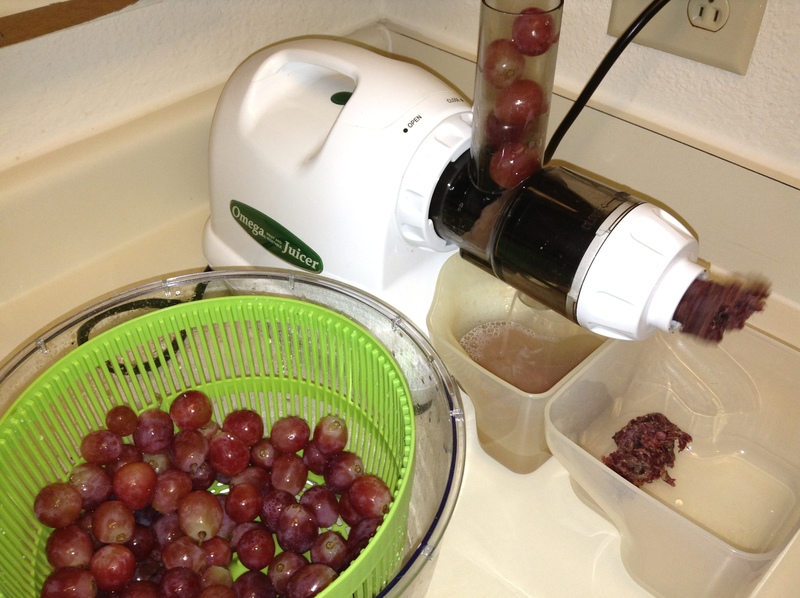 They actually yielded a lot of juice! Only drank about half a quart (16 ounces), as it was surprisingly bitter. I attempted to drink my remaining carrot concoction in the evening, but it perhaps went bad, spending most of the day in my lunch box. 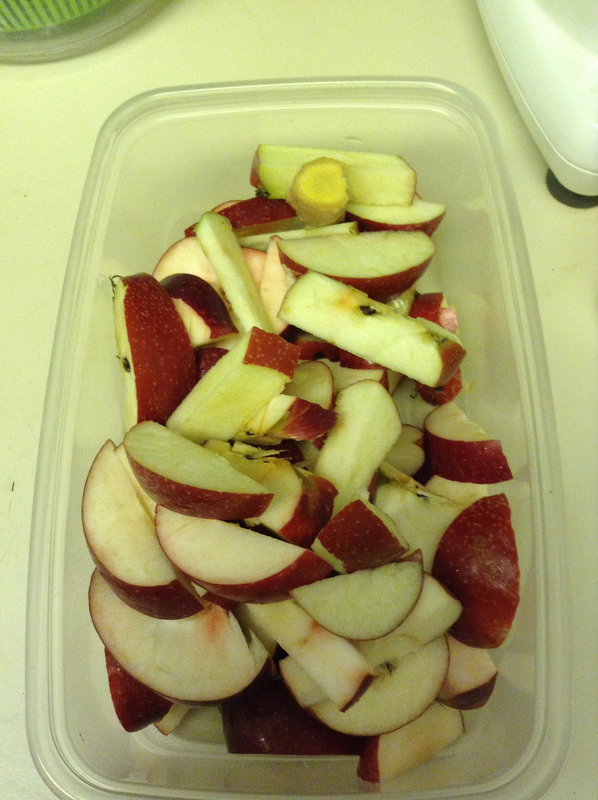 Drank the whole quart of the lettuce-apple-pear. Drank one quart of water. Had no water yesterday, by the way. 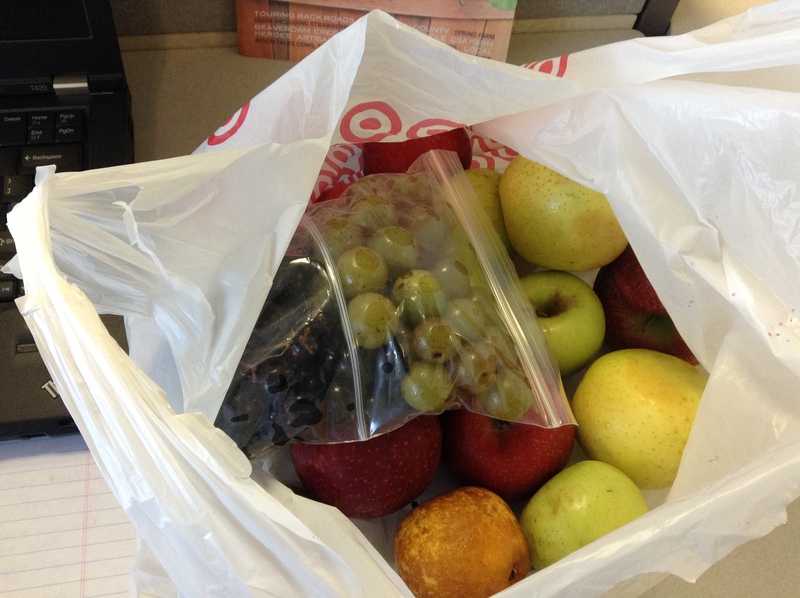 I went grocery shopping and bought 2 packs organic green grapes, 1 pack red grapes, 1 lb muscadine, 1 bunch cilantro, 5 lemons, 5 loose beets, and 3 lb bag carrots . Since I was at Whole Foods, I also bought a 20-oz spinach-bell pepper-apple juice, which is made fresh right in front of you. I don’t recall being hungry yesterday, but I was pretty hungry by night time tonight. I weighed this morning before dressing. That’s a weight loss of over 5 lbs in two days! 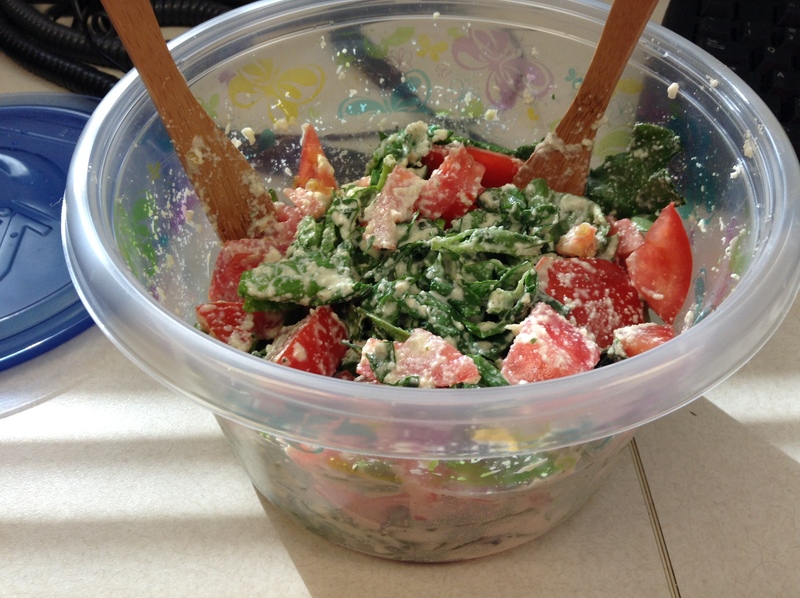 Today was a difficult day, and I thought about ending the fast…even if for a salad! I really wanted some vegan chik patties though, of all things. I haven’t had one of those in at least a year. So with the intense cravings for food, I thought it best to do some more research on juicing, for motivation, encouragement, and knowledge. 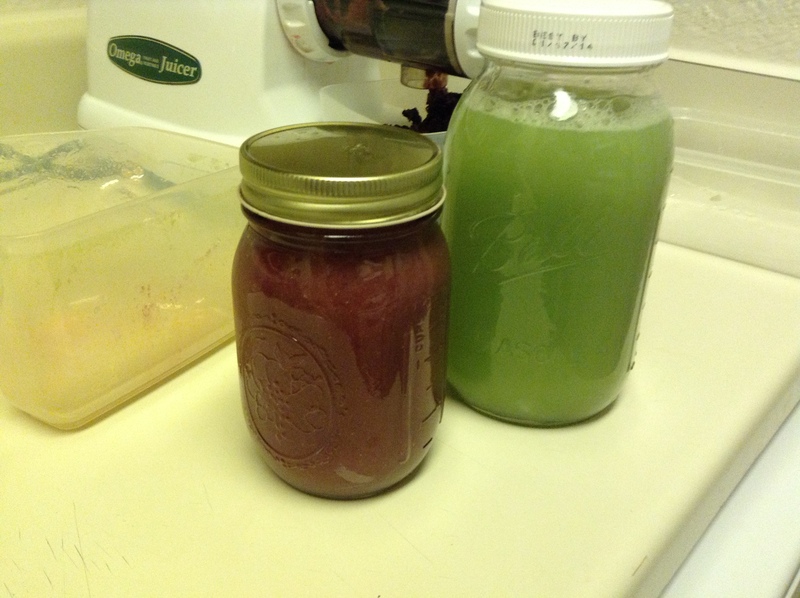 I think one of the things that had me a little down about continuing, is all the juicing! 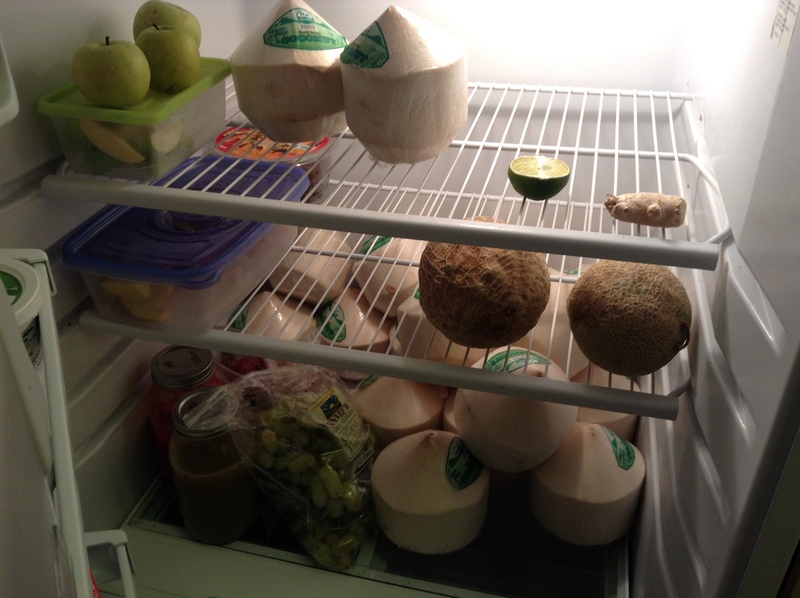 Then it hit me to go buy coconuts! I bought 2 cases of young coconuts(18 at $1.49 each) I THEN went to a local juicer (Urban Juicer) for a 24 oz orange-grapefruit juice called Mood Lifter. Giving myself a lil break from juicing! It’s interesting in some of the fasting tips I have read, people recommend at least 100 oz per day, and that’s exactly what I’ve been doing, and it feels enough. Today went much easier, effortless even. No juicing required. I was extra cognizant about drinking water today since I had a one-hour massage session. Massages loosen toxins stored in the body, and drinking lots of water is said to flush them out. 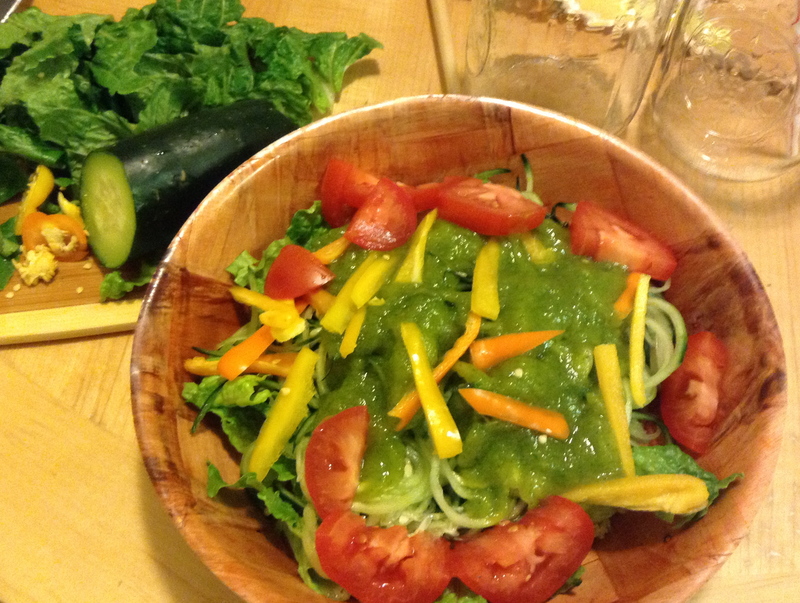 I spent most of the day (and last night) searching for raw food recipes, as I intend to be raw after this fast. 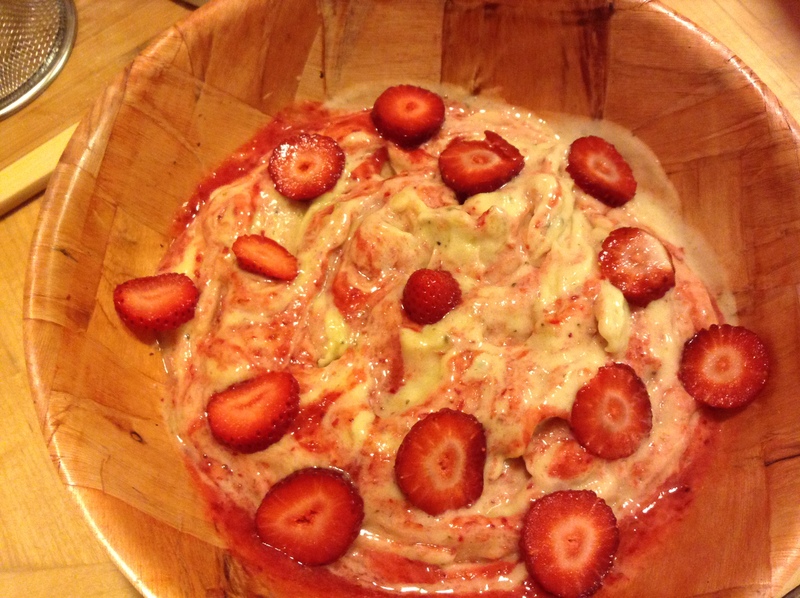 Reading the ones on Rawmazing’s site, makes me believe I could go raw for good this time. 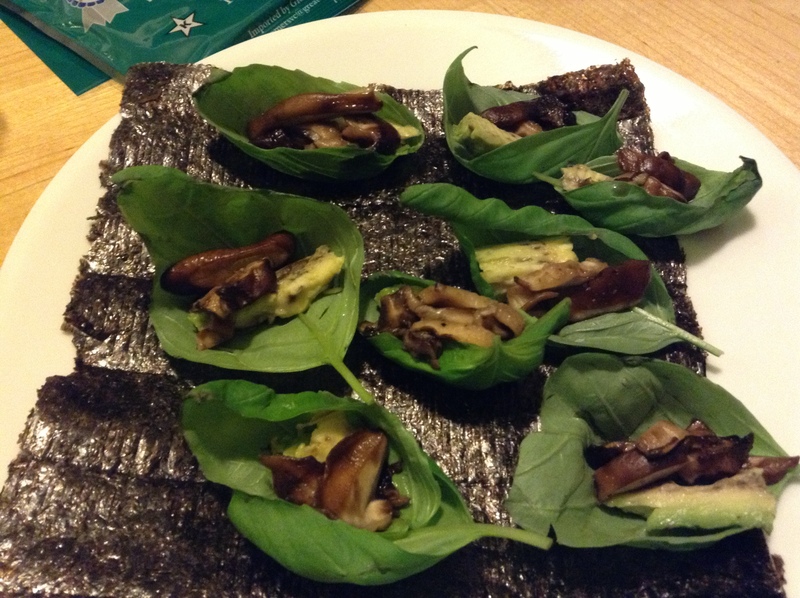 I’ve attempted to “go raw” at least a handful of times since becoming vegetarian 4 1/2 years ago. I’ve literally been combing the internet for Raw Vegan Indian, Mexican, etc and stumbled across other ideas that I wasn’t looking for but will probaly use, like raw bacon or “french fries” out of eggplant. After, copying and pasting the recipes into a word doc, including the food pic and website as source, I easily had 100 pages! I took the psyllium capsule around 9 am this morning, and it’s 9 pm…still no movement. So, I just took a Prunelax tablet. Sucess! Some movement in the morning, but nothing to sneeze at, so I took 4 psyllium capsules around 2 pm. I started to stock up on some raw food items while at Whole Foods: walnuts, pumpkin seeds, hemp seeds, golden flax seeds, spices & seasonings, raw agave, miso. 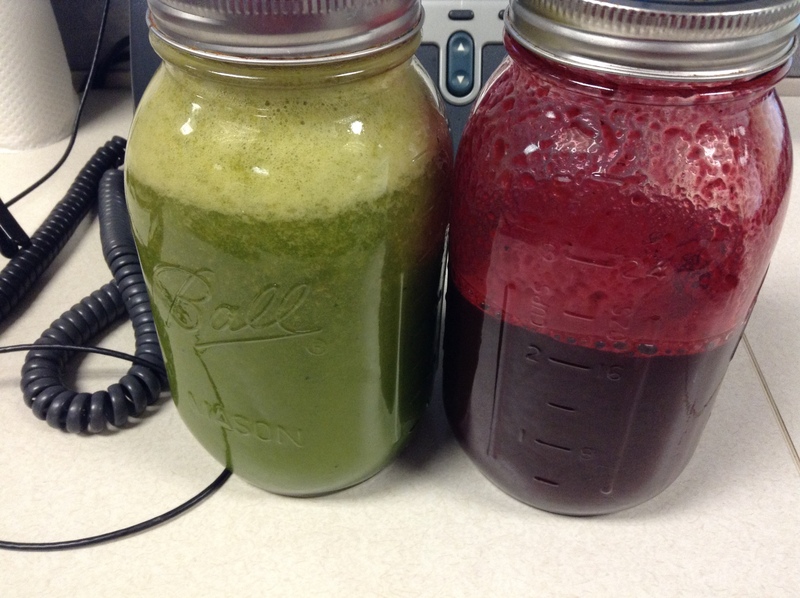 My #1 reason for going was for more juice, as I was not in the juicing mindset today. Now I’m going through the recipes I’ve saved to get a “Round 2” list together of non-perishables I can be stocking up on to be ready after the fast ends.